We would love to have you visit! We are located on the campus of the University of South Florida in Tampa. Visitors are required to purchase a daily parking permit. Click here to view a Google Map of CUTR’s location, the Parking Permit Vending location, and the Richard A. Beard parking garage are also tagged on this map. Learn more about visitor parking on campus, and here is a daily parking map. Campus maps are also available. Please do not park in any “Reserved” or “Disabled” parking spaces unless you have appropriate credentials. 3808 USF Alumni Drive, Tampa, Fl, 33620. Click to see the building layout, including important safety information. Exit at Fowler Avenue West. The campus is about 4 miles west of the I-75 exit. Turn right into USF’s main entrance (Leroy Collins Blvd.). Exit at Fowler Avenue and turn right onto Fowler. The campus is about 4 miles east of the I-275 exit. Turn left into USF’s main entrance (Leroy Collins Blvd.). Parking on the USF campus requires either the purchase of a daily parking permit or payment at metered parking (up to 1 hour) at several locations around the campus. A parking permit costs $5.00 and can be purchased from the Campus Information Center on your immediate right after entering the USF campus from Fowler Ave.
A permit is valid for ONLY the day scratched off on the USF permit. Scratch-off permits allow parking in the Richard A Beard Parking Garage ONLY. Visitors must park on levels 4 through 8 in the garage. From the main campus drive (Leroy Collins Blvd. ), turn left at the first light (USF Alumni Drive). Off Alumni Drive, you may park in the Richard A. Beard Parking Garage, (directly west of CUTR’s building). 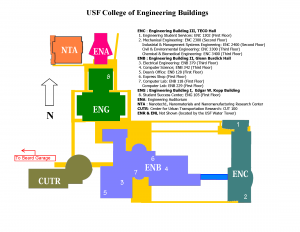 Please visit the USF website for USF Campus Maps. Click the map image below to see a more detailed map of the College of Engineering area of campus.